US, 2010, 88 minutes, Colour. Voices of: Justin Long, Hayden Panettiere, Dennis Hopper, Danny Glover, Larry Miller, Christina Ricci. Directed by Anthony Bell and Ben Gluck. 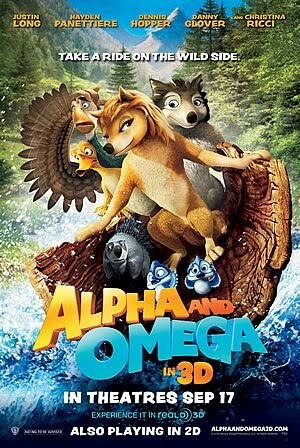 Alpha and Omega is an animation film for smaller children, which did not get wide theatrical release. The film shows the young wolves at play, the hierarchy between the alphas, the high-class wolves who are taught to hunt, in contrast with the omega wolves who are the ordinary ones. One might say there is a touch of the Romeo and Juliet with the romance between an alpha wolf and the rather genial omega wolf. At one stage, they are taken by a van to another part of the forest where they are meant to start repopulation of wolves. Most of the film is their journey back, a range of adventures, some humorous, many slapstick, an encounter with two chattering birds who play golf and who seem to recur unexpectedly at different times during the journey, humans who take the wolves in their van. Meanwhile, at home, there is a clash between two families of wolves, led by Dennis Hopper and Danny Glover. One is in possession of the area, the other searching for food. There is a famine, and instead of reuniting the two groups of wolves, there are fights. Ultimately, the two wolves come home, but there are plans for the alpha wolf to marry another alpha – however, despite the dominance of the mother and her bossing everyone around, there is a happy ending. This may be an entertainment for undiscriminating children – with the proviso that the wolf theme does not lend itself immediately to recommendation for young children.